Grant Olding trained as an actor at Central School of Speech and Drama. He has written several musicals including Simply Cinderella, Robin Hood, Tracy Beaker Gets Real, Spittin’ Distance and Three Sides. He has also written music for plays including England People Very Nice, The Alchemist, The Man of Mode and Southwark Fair, all at the National Theatre. He spoke to Adam Penford during the One Man, Two Guvnors rehearsals in April 2011. 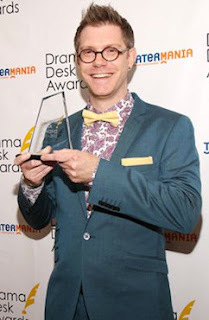 Grant Olding, with his Drama Desk Award for Outstanding Score for One Man, Two Guvnors. What were your initial discussions with the director about the role music would play in One Man Two Guvnors? The first conversations I had with Nick [Director Nicholas Hytner] were about time, place and style. He told me it was set in 1963, Brighton, and mentioned Ealing Comedies, Carry On films and early Beatles music. Later, he abandoned the above in place of skiffle music. Later still, it was Variety acts. Finally, we decided we would make our own rules up and create a hybrid of all the styles we wanted to incorporate. Nick began sending me YouTube clips of crazy Variety acts; people playing car horns and xylophones. We decided there would be music in between scenes, but we didn’t know if that would just be incidental music, or actual songs, or if there would be underscoring during the actual scenes. Before rehearsals began, we did a workshop and decided the band would be on stage and that would be the skiffle band that the character of Francis mentions in the play. What was your process for writing the music once you knew what the director required? Once I knew the type of instruments I needed to incorporate then the lineup of the band formed in my head. We did some workshops and I got the band playing all kinds of crazy stuff that hasn’t actually ended up in the show; bones, paper bag, musical saws. This inspired me to write the first song, My Old Man’s a Gannet, which was about food, a major theme in the play. Nick liked the idea that all the songs should incorporate various ideas from the play, without actually being about events which occur on stage. He told me to write a series of songs based on that concept and we would decide at a later point where those songs might fit in within the structure of the play. I had written about six songs before we started rehearsals and it was only then that we started talking about where in the show they might fit and who would sing them. Was the decision to have four members in the band a budgetary choice or because that’s how many musicians would be in a 1960s group? Originally, the NT had budgeted for three players, but I argued for four because it seemed impossible to do beat combo [three guitars, plus drums] music without four members. 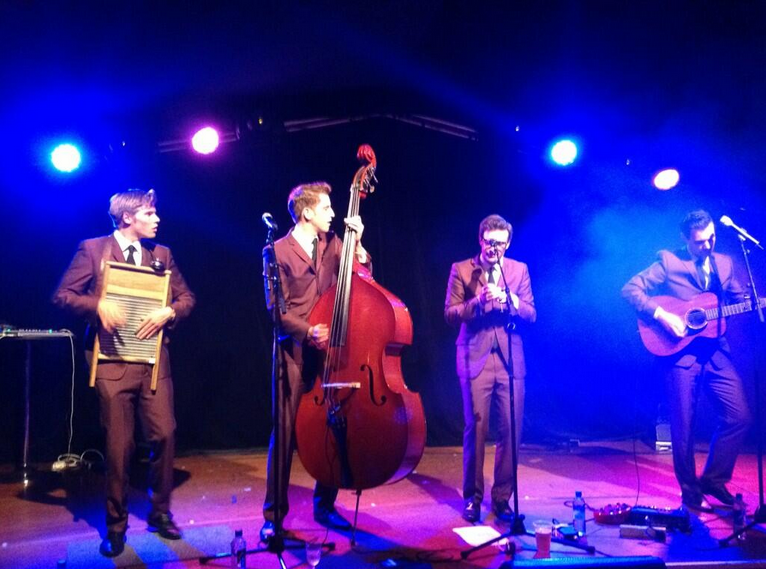 All those 1960s bands – the Beatles, the Kinks, plus skiffle bands – had four musicians. These discussions were before we’d decided if the music would consist of songs or instrumental music, and if we’d settled on instrumental we definitely would have needed a fourth member to play the melody. I don’t think I’d want to do it with more than four though, it’s the perfect number. Also, there was a point in rehearsals when we were discussing having a cast of actor-musicians, who would play the characters and then play instruments on stage during the musical interludes. We’ve kept an element of that in the production. How easy is it to find musicians who are willing to be seen on stage rather than hidden in an orchestra pit? It’s not very easy. I knew I needed young people, who were happy to get up on stage and would actually care about the show. Plus, Nick wanted us to feel like a real band, because of that I had these four players in my mind from the beginning. All of us have been in pop or rock bands before and I’ve worked with all four of them before, and they’ve worked with each other before as musicians on various musicals and are great mates. We had four band rehearsals before they joined the actors in rehearsal. If we didn’t know each other it would have been a nightmare as everyone would have been jostling for position. Within the first hour we were laughing and joking and messing around. This is a different show for me because I haven’t written out specific parts for each instrument. Instead, we all come up with ideas and try them out and work out what’s best. They are very versatile musicians. Yes. One plays the double bass and the electric bass. The guitarist has learnt the musical saw and the ukulele, although we don’t use them in the show now. The drummer learnt the washboard, paper bag, bones and spoons. The tricky bit is to keep it realistically 1963. How people perform now on stage is very different from then. 1960s performers stand in a certain way and bob their heads. It comes from a dance band tradition. Even the instruments that rock groups played in the 1960s came from dance bands. The performance style is more polite. It’s very different from the rock that’s played now. Any time our drummer throws in a fill or plays a bass drum pattern that doesn’t feel like it comes from the early sixties, it takes the audience out of it. And that’s been a real challenge. The bass drum is just keeping it really simple, keeping it to the 2 and 4 counts, not pushing beats and syncopating. The bass player’s problem is not to funk it up, because he is usually a really funky bass player. The guitarist has had to do lots of research into country music. For me as a composer, the big challenge was writing three chord songs, something really simple, real pop songs. No middle eight, just verse and chorus, two sections. Two or three chords at the most. Which do you write first: lyrics or music? I always write the lyrics first because I come from a musical theatre background. In a musical the music is always driven by a character, and therefore by lyrics. Saying that, most times when I’m writing a lyric I do actually hear the rhythm of the song in my head, so I have a vague idea of how the melody might go and then I’ll refine that. Sometimes, when I get on to writing the melody it takes over and I have to go back and rewrite the lyrics from scratch again. Many of the skiffle songs in the show are story songs, they have a plot progression. I often work out the story of the song first, where in the plot I have to get to in each verse and chorus, before I start writing. How does writing music for plays differ from writing songs for musicals? The main difference is that in musical theatre you tend to be in control of the whole show; in plays, you’re trying to serve everyone else. In a musical, the emotional journeys and themes, and therefore the structure of the show, are driven by the composer; so you’re dictating where the underscore goes, how you’re going to get into a song etc. In a play, the director gives you a list of what music they need; for example, scene change music or underscoring. If a scene change takes longer than expected, then they will ask you to write an extra twenty seconds of music. In One Man, Two Guvnors, there’s only one piece of scene change music which tells you something about the emotion of the characters (the blues music before the pier scene in Act Two which depicts Stanley and Roscoe’s depression). The test is that you could take the visual picture away and still tell, by the music, the way the characters are feeling. That’s more like musical theatre. You’ve worked with Nick a lot. Can you say something about the collaboration? We’ve worked together on five plays, and we have a common language; he doesn’t have to take ages explaining an idea to me. I like to be in rehearsals a lot so I can feel like I understand the production and Nick encourages that. I like to get to know the actors and what they’re doing with their character; the actors’ physicality tends to influence the music you’re writing for that character. Nick is brilliant at guessing exactly where the music should start, how long it needs to be to cover the scene change, and what the mood should be. Not many directors have that level of instinct.